60 UCU Left supporters attended an enthusiastic UCU Left organising conference on Saturday 28th January. The conference took place at a crucial moment for both the TPS and USS disputes, with debates going on in branches up and down the country. The recent NEC decision to reject the TPS deal and declare a day for strike action has created renewed momentum among the other rejectionist unions for a resumption of strike action and given new heart to those trade unionists determined to fight any sellout. The conference was chaired by Liz Lawrence, UCU NEC member, who welcomed a number of guest speakers in the first session before participants broke into separate USS and TPS organising sessions. John spoke about the worsening economic situation, saying that we were right a couple of years ago to take an apocalyptic view. Osborne’s plan was to cut the deficit using the claim that the crisis was caused by over-expenditure, cuts were needed in the public sector and manufacturing would rise to meet the gap. This hasn’t happened. Manufacturing is on its knees, with very limited new jobs. The Government can only see new cuts, and is panicking. The Euro is probably collapsing, by Autumn the government will come back for more cuts. While the Government has the Olympics and Jubilee distractions till then, we will see more cuts, and a further onslaught on the poor. In Greece people on the margins are people like us, families handing over children, we are going to degenerate into this. He predicted that things will get far worse than we have seen so far, the government is desperate. Levels of resistance in the last 18 months are higher than for a long time, more momentum than in eighties: November 2010 the student march, June’s industrial action, Nov 30th was almost like a general strike in some parts. The role of individual unions and activists is to recognise that the TUC are not part of our resources but our rank and file base is. So prepare people for what we have to face and that there is a resource capable of confronting the situation. Jobs, pensions, civilised society were built over last 150 years and are now under threat. It means recognising we have a consolidated demand of bringing this government down. Ian Bradley, a rank and file electrician in UNITE, described their dispute. The eight biggest contractors want to pull out of agreement, cut pensions, travel and lodging allowance, 25-30% pay cuts. Eventually pressured UNITE to ballot, 80% for all out stay out, but Balfour Beatty threatened injunction, UNITE caved, but the rank and file electricians organised independent unofficial strikes with 3,000 out anyway. Another ballot result is due this Thurs, they plan to bring everyone out. Gopal Pryamveda spoke on the HE White paper. The White Paper has been indefinitely postponed, which shows that action can stop the government. However, they may not be doing it so overtly but we will not have the same opportunities for scrutiny of what they will now try to get away with more covertly. They will try to argue that our side is only interested in maintaining the status quo, preserving the interests of the elite, and that the White Paper ‘opens up opportunities’. However, the threat from the private education sector will continue even if the HE bill does not go to parliament. spoke on behalf of Defend the Right to Protest. She is the mother of Alphie Meadows who was seriously injured, hit on the head by police and then charged with violent disorder during the student protests. Alfie will stand trial. Nothing happened about the police hitting him despite him needing brain surgery. UCU must stand with students, she said, who stood with UCU from the beginning and are still campaigning. UCU NEC said that the NEC decision of 20th Jan had created the potential for the rejectionist unions to reignite the strike action and stop the pensions attack. We must not delay or wait until more cuts come through in October: the fight is on now. We must fight to sustain and continue to deepen campaign. 100,000 had joined TUs in last 6-8 months. Dec 19th TUC had met, Unison, Unite and the GMB had sold out their members. Others including the NUT have rejected. Sally Hunt argued the government’s TPS offer is a significant improvement, but no-one else says that. Still increase in contributions, £20-£80 deducted; change from RPI to CPI indexation; increase in pension age to 68; and CARE not Final Salary. The accrual rate has changed but that gets lost. As Mark Serwotka says, there are some people in the TUs who don’t think they can win. N30 frightens some people. There is an acceptance by them and by Ed Miliband and Ed Balls of the parameters that there is not enough money to go around etc. There are alternatives – eg taxing the rich. Members are not fatigued and we do not need a fresh mandate at this moment of time. We have been arguing for escalation. However, some TU leaders want instead to manage a decline of the dispute. A ballot would take weeks. It would put us in danger of putting our members out of the potential to join with others in taking action over TPS. No other rejecting union is balloting its members. If we had done so it would have given credibility to a rubbish offer and put us in conflict with our partners in the coalition that we have so carefully created over the past year. On March 24th 2011 UCU took strike action and broke the logjam. This led to the June 30 strike and then to Nov 30. The NEC decision on 20th Jan broke the logjam again. The NUT will meet other unions who have rejected the deal to discuss taking further industrial action in March. USS special conference will discuss negotiators’ recommendation to suspend dispute so negotiations on designing a new CARE scheme can take place, and consideration of the concession made for those made redundant at 55 or over. The danger is we would never see dispute again if we accept the negotiators’ view. He said Malcom Povey had done a brilliant job of the report on USS. Whether to reject CARE was only defeated by 30 votes at Congress, so we can win at the Tuesday HE conference on not suspending USS dispute. We should tie it to TPS dispute. Separate meetings of USS and TPS members then took place. USS members reported back from their branches on the mood of members and decisions taken to support or reject the negotiators’ recommendations. It was agreed that there would be a meeting organised on Tuesday at the Conference for delegates from rejectionist branches. Model motions and amendments have been circulated, as well as Malcolm Povey’s briefing paper on the USS situation. A UCU Left flyer will be produced for the day. TPS members discussed feedback so far from branches and reactions to the survey on ‘readiness’ for industrial action which had been sent to branch secretaries last week along with a very restricted timetable for completion. NEC members reported back to those present the latest situation from other unions and the potential for strike action, including rolling action. A number of speakers stressed the urgency of the situation given that the rises in pension contributions were to be imposed on April 1st. It was agreed to produce a set of Frequently Asked Questions and a new model TPS motion for branches and regions. The conference heard from both Angie McConnell and Mark Campbell (candidates for VP and GS respectively). Both described being enthused by the conference and by the potential which clearly existed to resist a sellout in the TPS dispute and the lasting impact from the N30 strike. Each described how they would do their best, if elected, to ensure that the union campaigns and fights as hard as possible using all the means at our disposal to defend education and our members’ jobs, pay, pensions and conditions, and to resist attempts by the current GS to curtail democracy in the union and bypass elected bodies in favour of email plebicites. Mark talked about his main differences from Sally Hunt. Mark thinks we can fight and win. But Sally seems to think we can’t win so doesn’t want to fight. 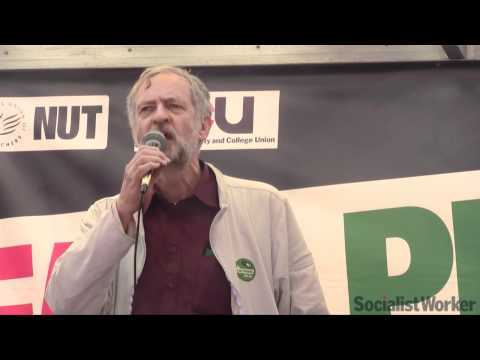 He talked about fighting the White paper – UCU has not been putting all its resources in. UCU Left has done a lot. He argued that it is right to use the word ‘political’ in post-16 education. Some think TUs are only interested in economic issues – jobs, pay, pensions. But the two are connected. And our values are crucial, the value of education as liberation. For example, we should defend the opportunities for people who didn’t get exams earlier, very often the sort of people who come to his institution, London Met. He is now involved in a major battle to defend hundreds of jobs under threat there, caused directly by the cuts and tuition fee rises. We have to defend students, be together in collective action. They had been right to protest. Nov 11th 2010 we split from Sally when she attacked students for a few broken windows at Millbank. Mark urged people to collect further endorsements for his campaign. The online endorsement link. Campaign materials for Mark and Angie and the other candidates were available from the conference and people were urged to hold local and regional meetings to plan the distribution of leaflets and detailed campaigning work to get the vote out in the elections which run from February 6th to March 1st. (These materials are also available here. A team of supporters was elected to coordinate preparations for the Annual Congress in June: the writing of motions (lots of people volunteered to prepare particular topics relevant to their branches), booking rooms for fringe meetings, and so on.